Facebook is always experimenting with different ways to boost engagement, most of them with a good level of logic and purpose, which have obviously helped the platform continue to grow and expand. But then there are others where it’s like ‘yeah, I don’t know’. 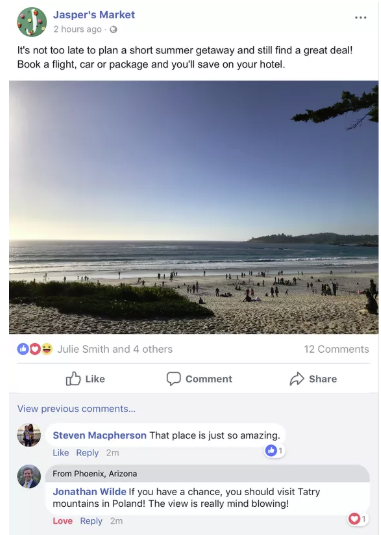 This new one is more in the latter category – as reported by CNet, Facebook is now experimenting with new ‘things in common’ labels which will appear above selected comments from people you don’t know on posts you view. You can see the tag in action above – Jonathan, who you don’t know and aren’t connected to, is also from Phoenix. Actually, it seems a little creepy. While Facebook’s usage data obviously suggests that highlighting commonalities increases the potential for interaction, amid the more recent data scandals and privacy issues, the timing may not be great for Facebook to roll out something which further highlights just how much it knows about its users, and can correlate their personal details. But then again, maybe it works - maybe Facebook users will be more open to communicating with people with whom they see they have some common, shared interest. For their part, Facebook says that this is only a small test among some U.S. users, and that there are no plans for a wider roll-out at this stage. "Knowing shared things in common helps people connect. We're testing adding a 'things in common' label that will appear above comments from people who you're not friends with but you might have something in common with." In some ways, it does depend on the commonalities shared, and on which posts. If I saw someone in my local area commenting on a niche interest post, that could alert me to a local connection, which could facilitate further communication. But something like the example above isn't particularly inspiring – knowing some local guy who I have no connection with also went to a travel destination wouldn’t make me more likely to want to go. But I guess, that’s where the other benefit could be. If Facebook can make this work, that could help facilitate business behavior, because you could see commonalities between other business owners and buyers, and that could help with your decision. For example, if I ran a hairdressing business and I was looking at a new PoS device, and one of the comments was also from a hairdressing business (which they hadn’t stated in the comment), that could provide relevant context. Given these considerations, it’ll be the applications of the tool that are most relevant, not the suggestions themselves. Too many random notes could seem creepy, but very targeted, relevant contextual insights may help. Either way, we’ll find out more from Facebook as the test evolves.